Tomorrow night, 5/1, at 7:00 pm we will be having a multimedia presentation and talk by linguist, feltmaker, scholar and photographer Rachel Lehr, "Mending Afghanistan Stitch by Stitch: Learning about Life in Afghanistan." Co-founder of Rubia, the Afghan Women's Handwork project, Lehr spends several months each year in Afghanistan, working and living with village women and children. Through compelling stories, brought to life by beautiful and informative visual images and an "Afghan Culture Trunk" of domestic artifacts, Rachel will take us into the homes of ordinary Afghans. Her photographs and personal anecdotes will illuminate the rich cultural heritage of Afghanistan in a rapidly changing world. Lehr will bring along a burka so American women and girls could gain a better understanding of what it is like to live behind a veil. Rubia is a non-profit organization which works to translate the heritage and skills of Afghan women into sustainable livelihoods. Rubia's embroidery project is actively involved in helping rebuild Afghanistan through education, skills training and the promotion of hand-embroidered textiles. This is an opportunity not to be missed. Everyone is invited! Ellis, Deborah. The Breadwinner [J ELL], and Parvana's Journey [J ELL], which continues the story started in The Breadwinner. It's always nice to hear from library users that they've enjoyed our books and other items. Yesterday I heard from someone who borrowed our Zoo New England pass and sent along pictures to show us how much of a good time her family had! Despite the attempts by a number of states to horn in on our first-in-the-nation primary, we're still number one and we still count! The NH primary is about 9 months away, and yet we are already awash in presidential candidate visits. Last weekend the Democrats were represented by Barack Obama and Christopher Dodd. This week, Republicans John McCain, Rudy Guiliani and Mitt Romney will all be here! To keep abreast of all the comings and goings, you should look at the sites of WMUR, the Manchester Union Leader, and the Nashua Telegraph. For an overview of all the candidates go towww.yournextpresident.net. The site claims it is "The Most Politically Unbiased Website On The Net." Are you looking for the candidate who best fits YOUR views, fill in the short survey at Select Smart and you will be matched with the candidate for you! The survey is updated occasionally, so if you've filled it out in the past, you might want to do it again--candidates point of views may have changed! If you're a teacher, you might want to involve your students in the primary tradition by utilizing some of the activities on NHPTV's New Hampshire Mock Election. Back to the first-in-the-nation primary--the New Hampshire State Library houses the Library & Archives of New Hampshire's Political Tradition. Not only does it have a historical collection of primary-related materials, the website has videos of primaries from the 1960's up to the present. It's 1996 and Ferris, a native New Englander as flinty and proud as the mountains around him, is once again about to predict the winners of the New Hampshire primary. He's been right in every election since 1952, when fate and a nose for news first led Pulitzer Prize-winning columnist Max Thomas to his door. It wasn't long before Ferris's uncanny accuracy began drawing the great and the not-so-great to the Notch to sound out -- and perhaps influence -- the crusty bellwether of political success or failure. This election, however, is different, as both Ferris and Max face the hardest test of their wisdom: confronting the truth about themselves, their lives and loves, and a society that has declined painfully during their half century of friendship. Brendan DuBois has a mystery (currently on order) that covers primary season in the fictional NH community of Tyler Beach, Primary Storm. Publisher's Weekly had this to say about it, "The snowy, cold New Hampshire winter forms the perfect backdrop to the twisting, surprising plot. By the end, readers will smile at the triumph of justice for even the most average of citizens." Take the time this year to get out and meet the candidates. Ask them hard questions. 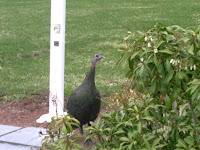 Only in NH do you get this golden opportunity to meet them all! A WILD Day at the Library! 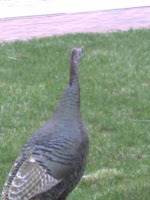 Today we were visited by a wild turkey. All alone, she wandered the library grounds in search of food. Luckily, I managed to get a few shots! 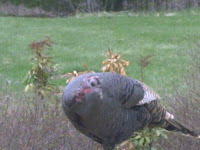 If you're interested in finding out more about the wild turkey, look for All About Turkeys by Jim Arnosky [J 598.6 ARN]. The illustrations are superb (not like my unclear photos)! Our reference librarian, Lois, has left this morning to attend her daughter, Norah's wedding at the United States Naval Academy in Annapolis, MD. We all wish Norah and Jeff a lifetime of love and happiness. The ceremony will take place in the chapel at the Academy. It's a lovely setting for such a memorable occasion! We've got you covered if you're planning a wedding--we have items dealing with wedding bargains, wedding vows, wedding toasts, interfaith weddings. We have CDs of wedding music, and a DVD of wedding dances. Visit the library and ask our reference librarian to help you find what you need--you'll just have to wait until the mother-of-the-bride returns to Windham! ...you've probably never heard of--National Day of Puppetry. It's coming up this Saturday, April 28. Quite coincidentally, we are having a puppet show here at the library tomorrow. Cinderella: A Woodland Fairy Princess will be performed by Gerwick Puppets. Gerwick Puppets are sponsored by our friends group, F.L.O.W.--many thanks to them! This slim book covers the complete puppet show process, from making puppets, to staging the show, to making up tickets and a program, and, includes recommendations for refreshments to be served! And here's something else you may not have thought of--if you make sock puppets with your kids, you'll be able to use up those laundry orphans! Yesterday, I spent the afternoon at NHPTV Channel 11 judging entries for this year's Reading Rainbow writing contest for kids. I think it was my tenth time as a judge and each year is always a lot of fun! Fortunately for the judges, the entries are narrowed down to ten per grade from the hundreds of entries. The variety of stories were wonderful. Of the many dozens I read, topics as diverse as a super hero cat and a guidebook to NH's endangered animals were covered. The artwork was exceptional also, one story, A Week in the Life of a Paper Doll included little pockets with doll outfits! Congratulations to all the winners, and to every child who entered! Maybe some day we'll be buying your books for the library! These are only a few! Check the DVD section in the next few months for many more! This coming Sunday, April 22, is Earth Day. 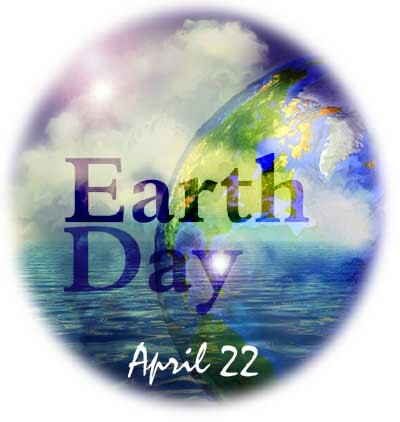 Earth Day is reported to be the largest secular holiday in the world! The first Earth Day was held 37 years ago. A lot has changed in the past 37 years, but our respect for the earth and its environment hasn't. The Environment (part of the "Opposing Viewpoints" series) [333.7 ENV]. Don't forget our magazine section! We carry E: The Environmental Magazine [MAG E] and OG (Organic Gardening) [MAG OG]. For "green" tips the internet is an overwhelming resource, so I've narrowed it down to two sites: b(eco)me and Ideal Bite: A Sassier Shade of Green. I hope the weather clears up for the weekend, if it does, visit one of the many New Hampshire Earth Day celebrations! I'd be remiss if I didn't mention that this is National Library Week, and today is National Library Workers Day! Happy day to all my co-workers. You do a fabulous job! How to celebrate...well, you could take a librarian to lunch, or bring lunch to the librarians. You could read a book about a library! Here are a few titles for kids that I like--I hope you will, too! Bruss, Deborah. Book! Book! Book! [JP BRU] The author of this one lives in NH! Knudsen, Michelle. Library Lion. [JP KNU] Such a sweet story! Parish, Herman. Amelia Bedelia, Bookworm. [E PAR] No, Amelia, a thesaurus is NOT a dinosaur! Spanyol, Jessica. Carlo and the Really Nice Librarian. [JP SPA] The nice librarian just happens to be a crocodile! I suppose the most important reason is because she warned the world of the dangers of the overuse of pesticides, specifically DDT. I'd like to remember her as a woman who was not afraid to speak out, and, she did it without shouting or name-calling--she used rationality. Today, where success is often based on one's ability to be "one of the guys you'd like to have a beer with," or one's cleverness, or one's willingness to bully opponents, Rachel Carson's common sense approach to educating the public about issues is sorely missed. Rachel Carson was born on May 27, 1907 in Pennsylvania. She graduated from college and went on to study marine biology at the Woods Hole Laboratory on Cape Cod. At Johns Hopkins U., she earned a masters in zoology. Carson became an employee of the U.S. Fish and Wildlife Service where she wrote informational materials, and later became editor-in-chief for the Service. The Sea Around Us [551.46 CAR], and Silent Spring [632 CAR], made her a best-selling author and a controversial figure. Some of Carson's articles, essays, and speeches have been collected in Lost Woods: The Discovered Writing of Rachel Carson [570 CAR]. 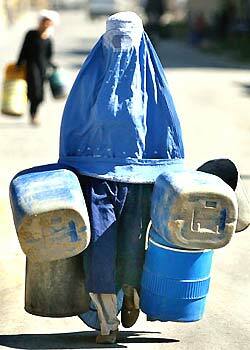 In 1999, Time Magazine listed her as one the "Time 100: The Most Important People of the Century." Rachel Carson loved Maine and also vacationed there. The Rachel Carson National Wildlife Refuge in Wells, ME, was named in her honor. Consider taking a drive up there this spring or summer, it's only an hour a way! 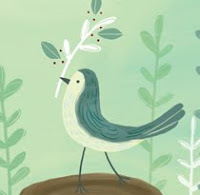 While enjoying in the natural beauty, spend a few minutes remembering Rachel Carson. This Sunday, April 15, marks the 60th anniversary of the day Jackie Robinson broke the color line in major league baseball. He made his debut as a Brooklyn Dodger (he remained a Dodger throughout his career) in a game against the Boston Braves. 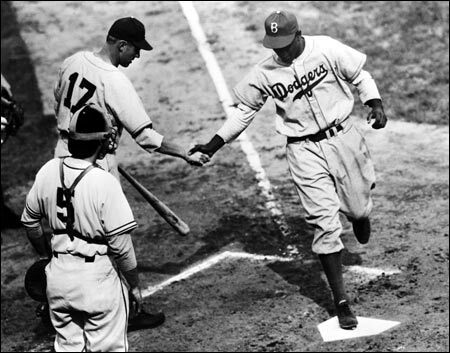 In that game Robinson scored the deciding run leading the Dodgers to a 5-3 win. Don't forget the film, The Jackie Robinson Story [DVD JAC], in which Robinson plays himself! Most of us listen with our ears, but those with diminished hearing learn also to listen with their bodies. This is the case of percussionist, Evelyn Glennie. Glennie is deaf, but that has not stopped her from finding music everywhere. I mean that literally--Glennie will tap or ping or pat everything from a glass bottle to a air duct to a fellow musician's head and she will find the music in it. This amazing woman is the subject of the film, Touch the Sound: A Sound Journey with Evelyn Glennie [DVD B GLE]. Not only is the music vivid, but the film's cinematography is also. I recommend it highly! Can you believe opening day at Fenway yesterday? 14 to 3! Unbelievable! Let's hope the Sox can go all the way this year! We'll see how Dice-K (Daisuke Matsuzaka) does today! We put up a new display yesterday morning--the theme? Red Sox, of course! Read this in conjunction with 1918 (see below). Don't buy tickets without consulting this guide, first! 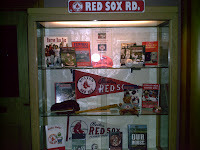 Many thanks to Elaine and Jane for the loan of the Red Sox memorabilia! Children's Poetry Day in NH Libraries! It's official--this coming Saturday, April 14, is Children's Poetry Day in New Hampshire Libraries. Governor Lynch signed a Proclamation last week making it so! The Proclamation is posted on the book display stand near the check-out desk along with several dozen children's poetry books. Now is the time to sign your child up for the poetry workshop being held here at the library on Saturday at 10 am. Children in grades 2 through 5 will join local poet George Jack for a lively poetry event that includes a series of fun and creative writing exercises. Mr. Jack will also be reading some of his favorite poems. Call the library at 432-7154 to register. Spend some time and peruse the display shelves, you won't be disappointed! A recent report from Chicago told of a coyote pup who entered a Quiznos and ended up sitting in the drink cooler. The poor thing was an item of interest for city dwellers, but, I find myself quite disturbed by the story. Wild animals should not dwell in cities! Coyotes have been able to take advantage of what they've found within city limits--pets and rodents to feast upon. I'm only afraid that someone will have a run-in with a not-so-docile coyote and then it'll be curtains for the coyotes of Illinois. Coyotes have been spotted right here in Windham! The species found in New England is the Eastern coyote. To learn more about these coyotes, take a look at In Search of the New England Coyote by Peter Anderson [599 AND], or read the wildlife profile sheet available online from NH Fish and Game. This is an interesting fact, "Although the historical evidence supporting occurrence of coyotes in New England is inconclusive, no coyotes were present in the late 1800s." Yet today, they are found in every county in New Hampshire! 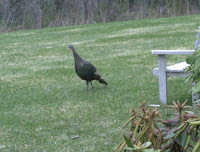 Like the people of Chicago, we have made it easy for these creatures to find lunch! Please, dear reader, if you have a cat or a small dog, keep it indoors! Don't you just love camp songs? I do. When my kids went to Camp Lincoln, they brought home lots of songs. The other day the phrase "Sardines! And pork and beans!" popped into my head. I knew it was from a camp song, but that was all that I could remember. I looked at our 3 volume CD set, 102 Camp Songs [CD CHILDREN ONE], but alas, the song wasn't in the collection. Next I tried several websites and still I couldn't find the song. Finally I resorted to asking my children, and sure enough, my son remembered all the words and was kind enough to write them down for me. They're included below. Don't be surprised if some day you come to the library and you hear shouts of "Sardines!" Sardines... Hey! And pork and beans....Hey! Every morning by the riverside.... Sardines! Lots of people standing by my side..... Sardines! Every morning when I open the door..... Sardines! Lots of people standing, begging for more. I got Sardines on my plate, and I don't need no steak. Sardines on a Monday... Hey, Hey! And on a Tuesday and a Wednesday... Hey, Hey! On a Thursday and a Friday... Hey, Hey! And On a Saturday and Sunday... Hey, Hey! It's been more than 18 months since Katrina hit the Gulf coast and yet it remains in the news. Next week at the New Hampshire Institute of Politics at St. Anselm's, Douglas Brinkley will be speaking on "Hurricane Katrina: Could it Have Been Avoided?" Brinkley is the author of The Great Deluge: Hurricane Katrina, New Orleans, and the Mississippi Gulf Coast [363.34922 BRI]. In our collection, we have Spike Lee's documentary, When the Levees Broke: A Requiem in Four Acts [DVD WHE]. This film is best viewed over a period of several days. I found it extremely hard to watch, but once I did, I was glad to have seen it. There is plenty of Katrina information on-line including Beyond Katrina: The Voice of Hurricane and Disaster Recovery, a website that presents the human aspect of the disaster, and the National Science Board, a site full of scientific reports. 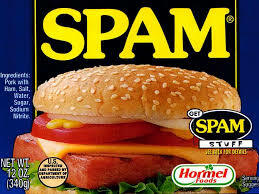 Of course there is a book for everything, and we have this one: SPAM: A Biography [641.66 WYM]. The book is written by Carolyn Wyman, the same woman who brought us Jell-O: A Biography [664 WYM]. So, once again, post your celebration suggestions, but remember, I'm the judge of what's real! Gentlemen, Where Are Your Engines? Cub Scouts don't need no stinkin' engines! They've got scout-powered Pinewood Derby cars! We've got a number of these cars, from Cub Scout Pack 263, on display for a few weeks. Be sure to see them! They're a big hit as the group below proves. To learn more about Boy Scouts of America, visit their website at www.scouting.org. Local scouting information is available on the Daniel Webster Council site. The Daniel Webster Council also owns and operates the Lawrence L. Lee Scouting Museum located at Camp Carpenter in Manchester. The library subscribes to Boys' Life magazine [J MAG BOY], and I find it to be one of my favorite children's magazines for its variety of well-written and illustrated articles. The Scouting Museum, mentioned above, has a collection of original cover art for Boys' Life as well as "essentially complete volumes of Boy's Life and Scouting magazines" in the museum's Max I. Silber Library. Those who like building model cars can look for Building and Detailing Scale Model Cars by Bill Coulter [629.22 COU] in our adult collection. Pinewood Derby cars may not have engines, but that doesn't mean they can't have engine noises. MouthSounds: How to Whistle, Pop, Click, and Honk Your Way to Social Success by Frederick R. Newman [J 790.1 NEW] can show you methods for making any number of car sounds, so, Gentlemen, start your engines! The next time you come to the library, take a look at this new book we purchased, New Hampshire Curiosities: Quirky Characters, Roadside Oddities & Other Offbeat Stuff by Eric Jones [917.42 JON]. 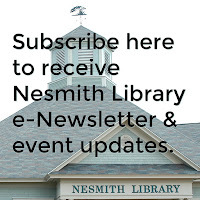 It covers some interesting celebrations such as the Zucchini Festival we held annually for five years at the Nesmith Library. We still have photos up on our website, so take a look! We also celebrated Talk Like a Pirate Day (September 19) for a few years. TLAPD is now a world wide celebration! So I guess it's time for us to come up with a new celebration for 2007. Any ideas? If so, post them to the comments section. 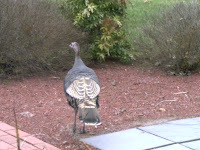 One celebration I think we'll let pass is the commemoration of the life of "Mike the Headless Chicken." Mike had an interesting story, no doubt about that! If you're traveling out west next month, you may want to join in Mike's Festival being held 5/18-5/19 in Fruita, Colorado. I'm especially intrigued by the Peeps eating contest! One or two Peeps at a time are okay, but I get queasy thinking about eating any more! Mike was once a fine chicken. Who was destined to be finger-lickin'. Took Mike's head off a bit. Making Mike, one frickin' rich chicken!